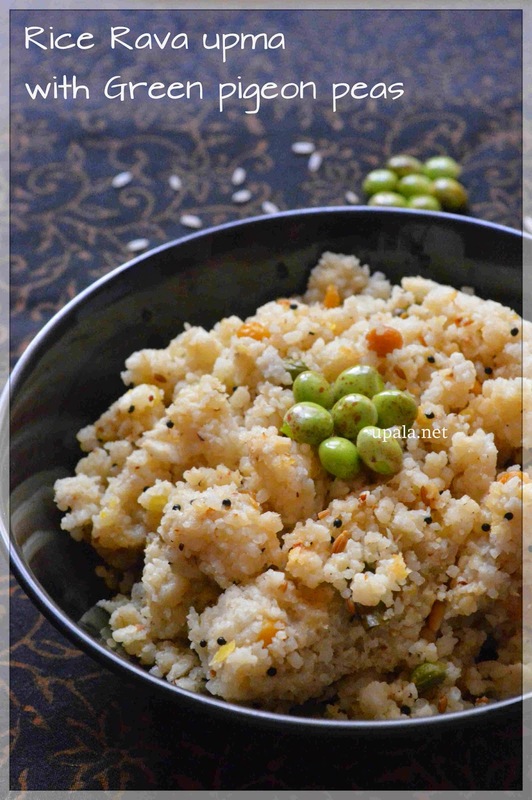 Arisi upma/Akki tari uppittu/Rice rava upma is a common dish either for Breakfast or for Dinner in south Indian homes. This Rice rava upma is prepared as plain upma or with veggies, here I have prepared this Rice rava upma with Green pigeon peas/Togari kalu (kannada). Togari kalu (Green pigeon peas) is nothing but the green fresh form of Toor dal/thuvaram paruppu/ togari bele. 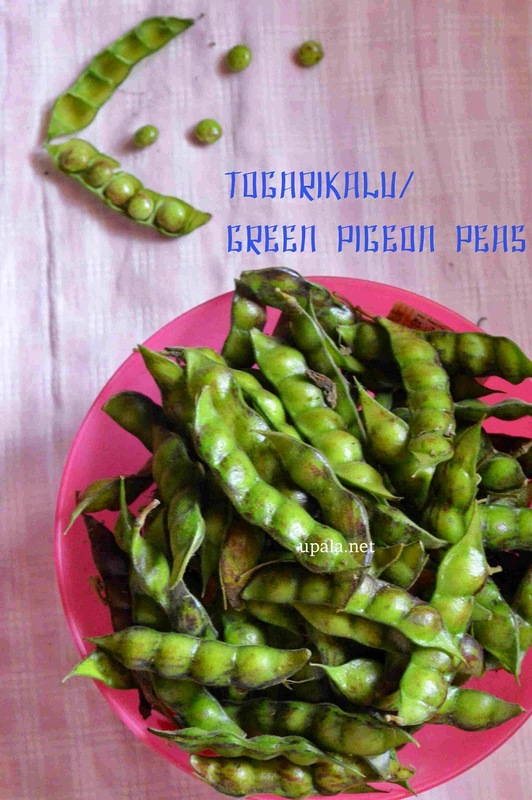 In Karnataka, Avarekalu (fresh form of mochai/hyacinth beans/Lablab) and Togari Kalu (Green pigeon peas) are very famous and plenty are available during season. Rice rava upma with Green pigeon peas came out so well and it tasted similar to green peas. 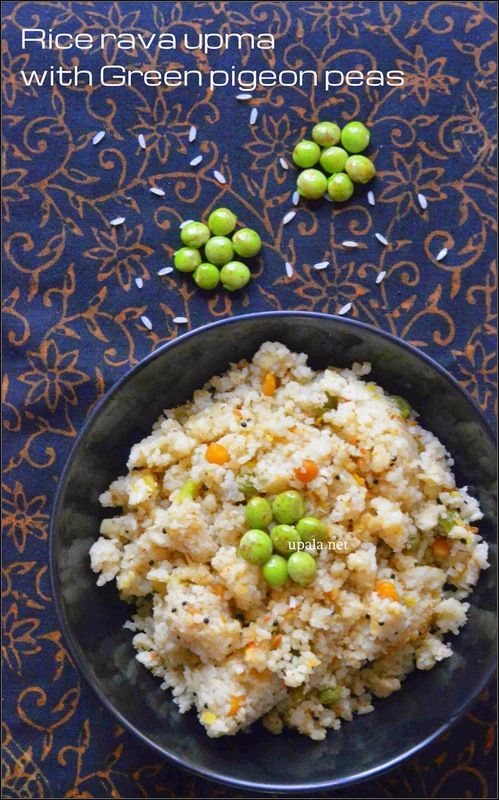 You can also try this upma/uppittu with green peas or Avarekalu in the same way. Also you can add all veggies (onion, tomato, carrot, beans, cabbage etc ) according to your taste. Here is the picture of fresh Togarikalu/Green pigeon peas. click here to know more about this protein rich dal. 1) Wash and drain the water from rice, let it sit for half an hour. 2) Heat a kadai and dry roast this rice till it comes as separate grains. 3) Transfer it to a plate to cool down. 4) After it cools, grind it to make as big rava. Measure and take this rava for 1 cup. Rest of the rava can be stored in airtight container to prepare upma next time. 1) Grind toor dal, cumin seeds and pepper to a coarse mixture. 2) Heat oil in a pressure cooker, add mustard seeds to crackle. Then add rest of the ingredients give in "For Seasoning". 3) After dals turn light brown, add Green pigeon peas/Tuvar lilva/Togari kalu and fry. 4) Then add 1 cup rice rava and fry for 2-3 minutes. 5) Add coarsely ground toor dal mixture and mix well. 6) Add 2 1/4 cups water and salt, and when it starts boiling add coconut. 7) Leave it to boil till rice gets half cooked and close it with the lid. Pressure cook it for 1 whistle. 1) You can also cook this upma in a heavy bottom pan/kadai in same way. Alternatively you can transfer the contents after adding coconut to electric rice cooker and cook. 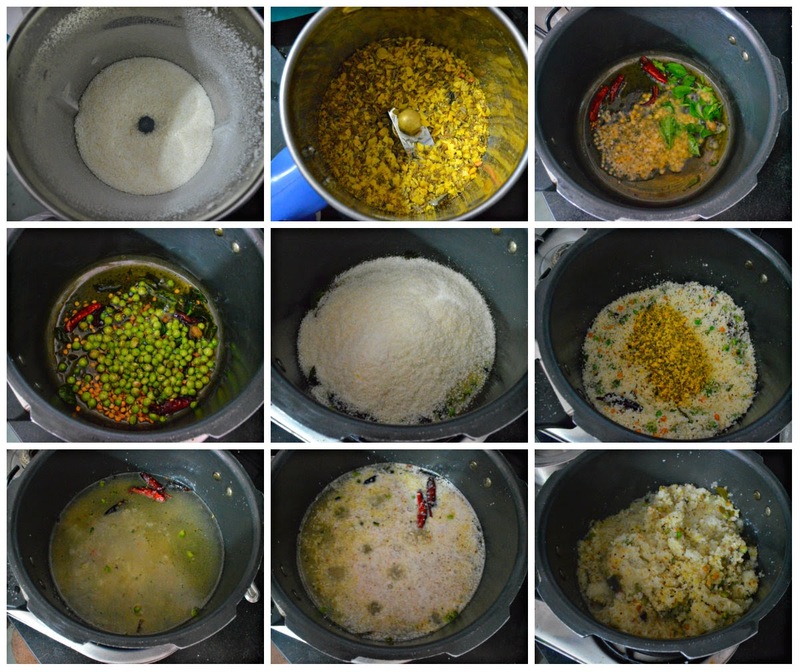 2) You can also grind Rice and toor dal mixture together, measure the quantity and add water accordingly.